I’ve been using Logos Bible Software since 2010 and I do not plan on going back. Logos has immeasurable value in my life as a follower of Jesus, pastor, grad student, and avid reader. What used to take hours of time in research now takes minutes, and that is not an exaggeration. On a Monday afternoon I received a phone call from a person who wanted to talk about something. Apparently the sermon from the day before had raised some issues that they thought they had moved on from but needed to talk about. So I scheduled a time to meet and went about my business. When the meeting time finally arrived and after some time was spent building some rapport, the person informed me that they had been sexually assaulted several times in their childhood and teenage years which led to a low self-esteem and poor choices in college. I couldn’t express my sorrow enough over what I was told. Let’s back up. I haven’t ever suffered sexual assault and hadn’t read a lot on how to help people who had. Since I’m familiar with RAINN, I know that every two minutes, in America, someone is sexually assaulted and that 44% of the victims are under the age of 18. Plus, 60% of sexual assaults are not reported to police and approximately 2/3 of sexual assaults are committed by someone the victim knows. These statistics are overwhelming and indicate that you are likely pastoring people who have or are suffering from sexual assault. Back to the meeting I was in. After the person opened up and shared a bit of their past with me, I spent time trying to console them (it was very emotional) and spent time praying with them. We decided to meet again the following week to talk more because the person wanted to know if God could ever love them and wondered if they were partly to blame for their sexual assault, which are common feelings from victims. Phew. I was very glad I had a week to pray and prepare for our next meeting. I knew that this was the first time this person had ever talked about this situation (they told me so) and that this was a big deal in their life. So I opened up Logos and spent some time looking for some resources in my library that I could use. Thankfully, the Biblical Counseling Collection includes Gwen Purdie’s No More Hurting: Living Beyond Sexual Abuse. Having the ability to read through this book using Logos is very helpful in giving someone like me, who had little experience dealing with people suffering in this way, some guidance and preparation for what might come up. So what happened to the person I met with? They are doing great! They were able to talk through some of their feelings and come to understand that what had happened to them was not something they deserved or even caused to happen. They had an awesome breakthrough in understanding God’s love for them and are now part of a great small group and helping other people who have been hurt. 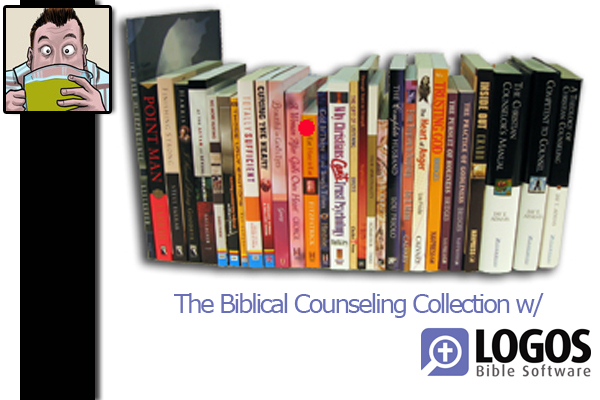 If you’d like to purchase the Biblical Counseling Collection from Logos, go here. You can either make one payment or set up a payment plan, which is an incredible option for pastors! You could also call 1-800-875-6467 to talk to one of Logos’ friendly staff. In my experience, they are both knowledgeable and helpful. One of the awesome benefits of using Logos is their return policy. Logos has a 30-day money-back-guarantee return period. So what are you waiting for? Order your copy today and tell them ThinkTheology.org sent you!